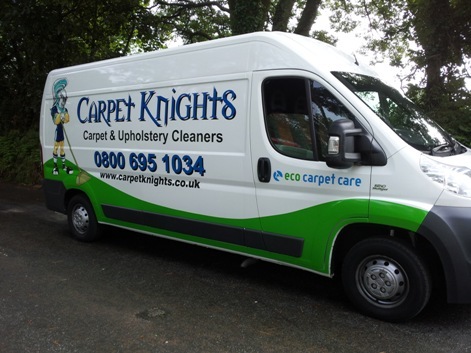 Carpet Knights was established in Cornwall in 2004 by local couple Goron and Sarah Knight as a professional carpet, upholstery and rug cleaning company. We are based in Truro and reach out to cover all of Cornwall offering people and businesses a high level of service and our customers now number in their 1000’s. From very early on we were committed to using environmentally friendly practices and products which we find now give a superior result to traditional products. All our technicians are fully trained, insured, CRB checked and uniformed. Carpet Knights came to clean all our stair and hallway carpets which as a busy guest house endure a lot of heavy use. I was very impressed by the lack of fuss involved in the process and that there was minimal disruption to our operation. More importantly, the final result was excellent giving the carpets that almost new look again which is very important for arriving guests and their first impressions. I would not hesitate to recommend Carpet Knights to anyone requiring a professional and excellent carpet cleaning service. Carpet Knights came to clean our 3 seater and 2 seater cream leather sofa’s. The job was done in a very professional manner with excellent results. Goran was very hardworking and provided brilliant results far above what we thought would be possible. Goran was fantastic, very polite and helpful. We have previously used Carpet Knights for our household carpets again they gave us brilliant results when we thought we might have to replace them. Excellent job, keep up the good work. We will definitely recommend them to our friends. We feel very lucky to have found Goron and Carpet Knights. They are totally reliable and professional in everything they do. They work hard whilst on site and achieve a great result at a very competitive price. On top of all that we find Goron a really pleasant, helpful ‘can do’ type of guy. CAN’T RECOMMEND HIGHLY ENOUGH. May they go from strength to strength. Carpets looking like new! Thank you Goron and Sarah for your friendly and professional approach. We are extremely happy with the result.